A working pair of car wiper blades are a must for any vehicle. When blades are worn, they’ll streak, smear and skip, and wont adequately clear your windshield. You need to have maximum visibility when driving – worn blades should be replaced immediately. Winter can present challenges to your wiper blades as no other season can. Ice, snow, sleet, road salt, mud and debris can cause your blades to wear out faster. Under certain conditions, blades or frames can break, rendering your wipers inoperable when you need them most. You may have heard recommendations to replace your wipers blades every six or twelve months. Under normal conditions, this recommendation is sufficient. However, if your car is exposed to prolonged and severe winter conditions, then an immediate replacement may need to be warranted. 1. 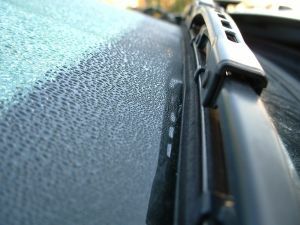 Worn rubber – Cracks, chunks of missing rubber and splits are signs that your wiper blade needs to be replaced. 2. Broken frames – Frame arms and joints can detach at critical connection points. 3. Metal wear – Signs of corrosion on metal claws and joints can lead to wiper arm failure. 4. Lift carefully – Carefully place blades in the erect position and gradually help them make contact with the windshield. Wipers without full contact to the windshield or loose will not get the job done. Reattach or replace as needed. 5. Windshield fluid – Besides checking the blades, arms and related parts, make sure that your windshield washer fluid reservoir is filled. Use an agent designed not to freeze in winter. Make sure that squirt holes are unblocked before heading out. Keep in mind that many sport utility vehicles and crossovers have a rear wiper blade that should be inspected and replaced as needed too. Always keep your windshield clear of ice; try not to use your wiper blades to remove frozen material as that will cause your blades to wear out faster. Finally, replace your wipers at the beginning of winter and your blades should last for the season. Replace them again before summer and you should always have a clear view of the road. Consider keeping a back up pair in your trunk just in case.